About Me – Hello. Welcome to Andrew Mathews' site! Hello. Welcome to Andrew Mathews' site! I am currently Associate Professor in the Department of Anthropology at the University of California, Santa Cruz. 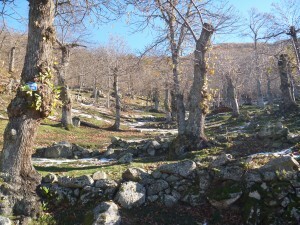 The photo above is a valley near the Etruscan city of Cortona, Italy, a place where I spent a good part of my childhood. The valley has one of the best developed terrace systems in the world and has been cultivated for at least 2,500 years. My research, both in Mexico, and more recently in Italy, has been inspired by my belief that long term environmental and social sustainability of the kind I saw in Italy is possible in other places. Around the world, peasants and indigenous people developed very long term traditions of experimenting with plants, animals, and soils. We can learn from these traditions of experimentation, and we can bring them to bear upon contemporary climate change politics, including questions of state formation, political economy, and ecological modeling. My research in Mexico focused on the culture of state and indigenous environmental institutions and on the links between indigenous forest communities in Oaxaca, the national forest service, and internationally circulating forestry science. This project emerged in my book Instituting Nature, (MIT Press, 2011), which was both a history of conservation and forest management in Mexico, and a history of the particular landscapes where modern forestry and conservation came to be applied. I describe the history and culture of state forestry institutions and of indigenous forest communities in the state of Oaxaca, and on the environmental history of the forests of the Sierra Juárez. In this book I combine theories of statemaking with science and technology studies to argue that the production and management of ignorance are as important as knowledge to the assertion of state power. In addition to my concern with human/environment relations, he have research and teaching interests in anthropology of bureaucracy and financial markets, anthropology of law and illegality, political ecology, environmental history, landscape history and visual representations of nature, sociology of knowledge, science and technology studies and state building. Most recently, I am using historical ecology and natural history methods to study forest histories and climate change politics in Italy. Chestnut Grove Near Fosciandora, Lucca, Italy, November 2013. Current Projects: Climate Change and the Anthropocene. I am currently working on a book on the historical ecology, natural history, and climate politics of Italian forests, very tentatively titled Plant Politics. In Italy, as in most industrialized countries forests have been reimagined as a source of sustainable energy produced in biomass electricity plants. Italy has important lessons for our efforts to confront our contemporary environmental predicament, the era that many people are calling the anthropocene, where most ecosystems around the world have been profoundly affected by human activities. In the Mediterranean, and in Italy in particular, people have been shaping soils, terraces, drainage systems, and trees for several thousand years. We know that climate change is likely to bring more intense climate events: floods, droughts, landslides, and forest fires. Because Mediterranean ecosystems have evolved to cope with dramatically variable climate, powerful disturbances, and intense human modification they are good places to learn about climate change and the anthropocene. We can learn hopeful and warning stories from this experience and we can also learn how climate change is experienced and acted upon in a landscape that is deeply anthropogenic. If you would like to learn more about my present or past work, feel free to contact me here . To view a recent resume, click on the icon below.